Culms: Erect, slender, solitary or tufted, glabrous. Blades: Flat, 1/2 to 7 inches long, less than 1/4 inch wide, soft-hairy. Sheaths: Rough, flattened toward collar, soft-hairy. 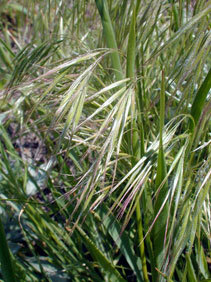 Inflorescences: Panicles, open, 2 to 8 inches long, much-branched, drooping, somewhat 1-sided, often purplish at maturity. Spikelets: Slender-stalked, 4-8-flowered, 1/2 to 3/4 inch long; glumes unequal, soft-hairy; lemmas to 1/2 inch long, downy, awns 1/2 to 3/4 inch long. Habitat: Dry disturbed sites, roadsides, and waste areas. Forage Value: Downy brome offers fairly good forage value prior to inflorescence emergence but has practically no value after that time. Songbirds and turkeys consume the seeds. Comments: Tufted. An aggressive, cool season weed. The awns can injure the eyes and mouths of grazing livestock and contaminate fleece.